O n 22 March 1907, German Governor Frederich von Lindequist proclaimed three nature reserves, one of which was Game Reserve No 3 in the central Namib Desert. Renamed as the Namib Desert Park in 1962, this tract of the scenically beautiful desert was amalgamated with the Naukluft Mountain Zebra Park (proclaimed in 1968) and unoccupied state land in 1979 and proclaimed as the Namib-Naukluft Park. Portions of the Diamond Area as far south as the Aus/Lüderitz road were subsequently added, which virtually doubled its size to 49,768 km2, making it the largest conservation area in Namibia, and one of the largest in Africa. Today the Namib-Naukluft Park is Namibia’s most versatile conservation area. The top attraction in the park and one of the country’s major tourist destinations, second only to the Etosha National Park, is Sossusvlei, renowned for its spectacular, desiccated white pan surrounded by majestic star-shaped dunes with deep, warm hues, and close by, the eerie Dead Pan with its bleached skeletons of ancient camel-thorn trees. Other features in the Namib-Naukluft Park are Sesriem, the Welwitschia Trail, Sandwich Harbour, the Naukluft Mountains and the Kuiseb Canyon. This section is situated in the central and southern Namib Desert. Ostrich, springbok and gemsbok are conspicuous especially on the desert plains, while Hartmann’s mountain zebra, klipspringer and baboon frequent the canyons of the Swakop and Kuiseb rivers, and leopard and African wild cat move in and out of the Kuiseb Canyon. Larger predators found here are spotted and brown hyaena, and smaller predators black-backed jackal and bat-eared fox. An intriguing host of small creatures have adapted to survive in the Namib dunes. The fog-basking beetle, Onymacris unguicularis, drinks water by positioning itself on the crest of a dune, dropping its head and extending its hind legs. Its back serves as a condensation surface for fog, which forms droplets and slides downwards towards its mouth. An intriguing ‘thermal dance’ is performed by the shovel-snouted lizard, Meroles anchietae, to cope with the extreme heat radiating from the dune surfaces. The Gobabeb Training and Research Centre on the banks of the Kuiseb River has an international reputation for researching Namib ecology. On certain weekends – the dates are announced in the local media – nature lovers are hosted at Gobabeb and introduced to the wonders of the Namib. 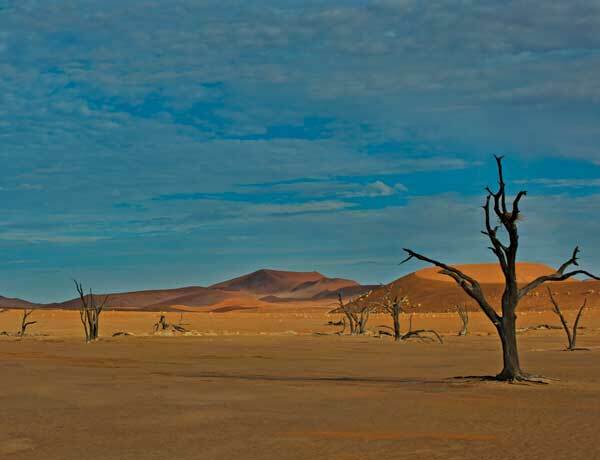 Many visitors to Namibia say that no part of the desert is visually more dramatic than Sossusvlei with its monumentally high dunes. These gigantic star-shaped mountains of sand – one of the largest was measured from the base as 325 metres high – are a sought-after topic for artists and photographers. The warm tints of the sand contrast vividly with the dazzling white surfaces of the large deflationary clay pans at their bases. One of these, referred to as Dead Pan, is a large ghostly expanse of dried white clay, punctuated by skeletons of ancient camel-thorn trees, carbon-dated as being between 500 and 600 years old. 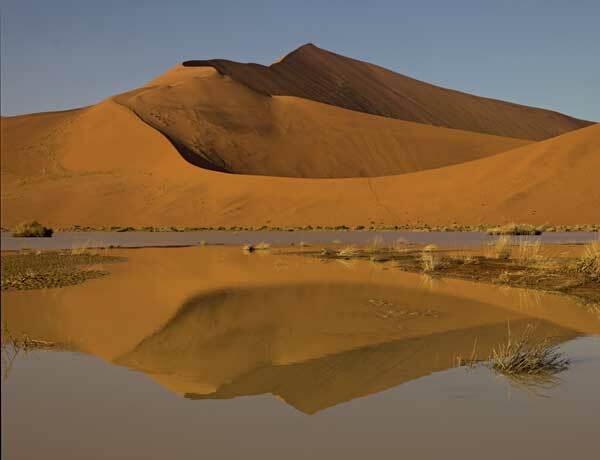 Sossusvlei’s mountainous dunes lie at the end of an erosional trough formed by the Tsauchab River. They are shaped by strong multi-directional winds, primarily the southwester, and have three to five sinuous crests, which meet at the highest point to give them their characteristic star shapes. 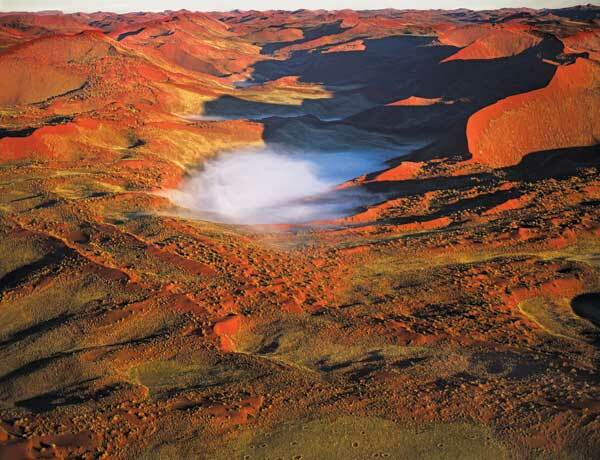 Visitors are allowed access to Sossusvlei only between sunrise and sunset. The first 60 km of the road from Sesriem to Sossusvlei has a permanent surface and is suitable for sedan cars, whereas the last five-kilometre stretch of sandy track is negotiable by 4×4 vehicles only. A shuttle service is available for people who do not want to hike the last 5 km. The permit office complex for entry to Sossusvlei and other destinations in this section of the park is at Sesriem. Four kilometres south from here is Sesriem Canyon, where the erosion of many centuries has incised a narrow gorge about 1 km in length. At the foot of the gorge, which plunges 30–40 metres, are pools that become replenished after good rains. Sesriem derives its name from the time when early pioneers tied six lengths of rawhide thongs together to draw water from these pools. To early inhabitants, the gorge was an important water source in an otherwise waterless area. Even during very dry times, there is water in the upper reaches of the canyon, where the deep clefts reduce evaporation. The Tsauchab River flows through the Sesriem Canyon and continues down to Sossusvlei. A conveniently situated lodge for visiting Sossusvlei is the Namib Naukluft Lodge. Hammerstein Lodge & Camp is beautifully located between the Nubib and Tsaris mountains. Next to the Sesriem entrance to the vlei is Sossusvlei Lodge, its Bedouin-style brick-and-canvas bedroom units blending with the warm colours of the dunes. Setting a new standard for luxury camping is the Desert Camp, situated on a 40 000-hectare private game reserve only 4 km from the Sesriem entrance gate to Sossusvlei. Sossus Oasis Camp offers 12 sites in a semi-circle with luxury facilities in a clean, tidy and well-kept environment. More accommodation close to Sossusvlei is offered at Kulala Desert Lodge located on the 37 000-hectare private Kulala Wilderness Reserve. One of Namibia’s most unusual desert lodges, Rostock Ritz Desert Lodge, is well-positioned for experiencing the Namib Desert at its best and also for visiting Sossusvlei and the Namib-Naukluft Park. To the west of the Tiras Mountains lies the Kanaan N/a’an ku sê Desert Retreat. You can also visit the Neuras Wine and Wildlife Estate in the foothills of the Naukluft Mountains. Permits for the Namib-Naukluft Park are available at Ministry of Environment and Tourism permit offices in Swakopmund (064 40 4576), Walvis Bay (064 20 5971) and Windhoek (061 284 2111). Permits are also available at Sesriem. Namibia Wildlife Resorts (NWR) manages several campsites in the Namib-Naukluft Park. One of the most popular of these is at Naukluft, the mountain sanctuary created for Hartmann’s mountain zebra. In the Namib section of the Namib-Naukluft Park in the Gobabeb environs are several state-run camping sites where fireplaces and toilets are provided. However, visitors need to be self-sufficient in respect of water, firewood, fuel and food supplies. The campsites are at Kuiseb Bridge (along the C14), Homeb (Kuiseb River), Swakop River (en route to the Welwitschia Plains), Mirabib (between Gobabeb and the C14), Bloedkoppie (spectacular surroundings), Groot Tinkas (four-wheel drive only), Ganab (wide-open spaces), Vogelfederberg and Kriess-se-Rus. Permits are needed to camp here, which are available from the offices mentioned above. In the shade of enormous camel-thorn trees just past the entry gate to Sesriem and Sossusvlei is Sesriem Campsite. Sossus Dune Lodge is the NWR’s first exclusive lodge in the Namib-Naukluft Park, built primarily from wood, canvas and thatch in an attractive ‘Afro-village’ style. What originated as a dream to extend the frontiers of the Namib Desert by integrating a large number of former sheep farms and rehabilitating the land into a sanctuary free of fences and other farm paraphernalia became the NamibRand Nature Reserve during the second half of the 1980s. Many facets of the Namib Desert are represented at NamibRand, creating a living tapestry of colour and contour that makes it a visual utopia for artists and photographers. 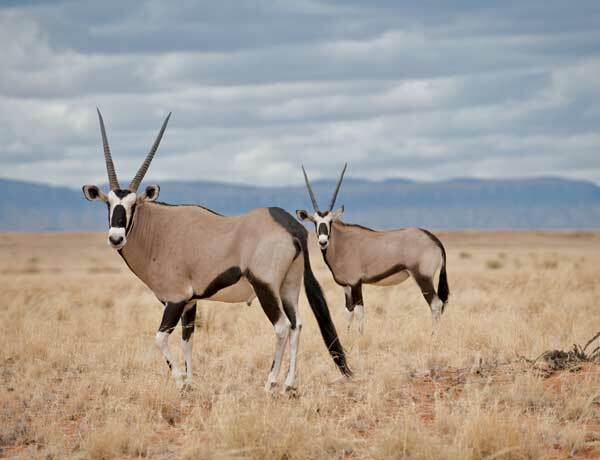 Game species found on the reserve include gemsbok, giraffe, mountain and plains zebra, springbok, red hartebeest, bat-eared fox, spotted hyaena, Cape fox and African wild cat. In the more rocky areas are kudu, klipspringer, baboon and leopard, while the dunes harbour a rich and diverse microfauna of lizards, beetles and spiders, and even the elusive golden mole. The reserve is also home to a rich variety of birds – over a hundred species have been recorded on NamibRand. The NamibRand Nature Reserve of today comprises 15 farms and extends over an area of some 202,000 hectares, making it one of the largest private nature reserves in Southern Africa. Situated on the reserve are the Namib Desert Environmental Education Trust (NaDEET) Centre, and the NamibRand Desert Research & Awareness Centre. Tourism enterprises at NamibRand include the Wolwedans Collection, consisting of Wolwedans Dune Camp, Wolwedans Dunes Lodge, Wolwedans Private Camp, Wolwedans Mountain View Suite and Wolwedans Boulders Safari Camp. About 72 km south west of Maltahöhe, situated amongst rolling red hills, is Duwisib Castle, a solid rectangular structure of red sandstone with battlements and turrets on its corners. Built by the legendary Baron von Wolf for his American wife, Jayta, the castle was completed in 1909. Most of the construction materials, including the furniture and fittings, were shipped all the way from Germany, off-loaded at Lüderitz and transported to Duwisib by ox wagon. The interior of the castle and much of its original furniture and artworks can be viewed. Accommodation in the surroundings is provided at the Duwisib Castle Campsite, managed by NWR, and a privately-managed guest lodge. After months of renovations by an internal team, Namibia Wildlife Resorts (NWR) officially re-introduced Duwisib Castle back onto the market on 1 August 2014 with the purpose of giving individuals the opportunity to be accommodated in a 19th-century Castle.